Unconscious improvisation number two didn’t turn out all that weird. Chicken breasts, vegetables, and chicken gravy. on Flickr. Unconscious improvisation number two didn’t turn out all that weird. 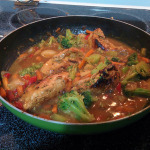 Chicken breasts, vegetables, and chicken gravy.